MotoTally supports several legacy LED displays, but recommends a flat panel computer monitor. Recommended flat panels offer superior performance to the legacy LED/serial displays. None of these displays are technically rated for outdoor use, but they will work great with a little care. They aren't waterproof, so you will need to protect them from the elements. Most of the time, you hang the rider race display from the inside of an EZ-up, so they are at least somewhat protected from rain. All of the supported displays show the same information, but the flat panel monitor and the two line displays can show ALL of the information on one screen, whereas the one line displays will alternate every second or two between two lines of information. Test / Tech Inspection Mode: While in test mode, the display will simply show time of day when not reading a transponder. While a transponder is being read, the display will show the bike number, number of reads, rider name, and class the rider is entered in for the current event. 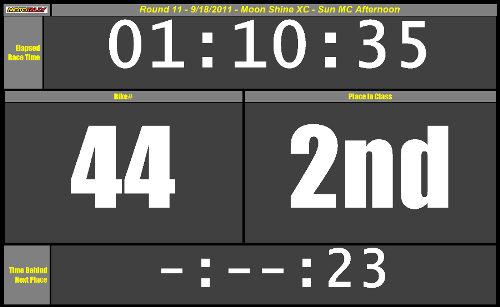 Race Mode: While in race mode, the display will show the elapsed time for the current race. 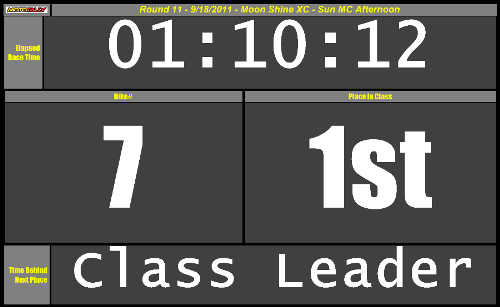 Once a rider passes throught the scoring gate, their bike number, class place, and time behind next place will be shown on the display. Use a flat panel computer monitor! Hook up an external computer monitor (LCD/LED flat panel) to your scoring laptop, and drag-n-drop the Rider Race Display form over to it. As the rider comes through the scoring lane and their lap is recorded (via manual entry, bar code, or RFID transponder), this display updates and tells the rider what the elapsed race time is, the bike number that was recorded, what place he/she is currently in, and how far behind the next place they are. An added benefit is a visual cue to your scoring personel that everything is working properly and the rider's lap was recorded. Not all flat panels are created equal. I can recommend some models that work very well in high ambient light conditions (like outdoors), so well in fact that you can read them in direct sunlight. Not only is the information displayed in very easy to read high contrast and high resolution, but all the information the rider needs fits on one screen. This information is also updated much faster than the legacy LED displays, for less lag in your scoring lane. The flat panel will hook up to your scoring laptop via a standard 15 pin VGA cable, or via HDMI, meaning you don't have to mess with serial ports, USB to serial converters, or configure the COM port! Another advantage is that you can get whatever size display you want, although I have found that wide screen flat panels in the 21-24" range work great. Best of all, you can get a good monitor in this size for much cheaper than the legacy LED displays (under $200). Bike# 7 in 1st place. Bike# 44 in 2nd place, 23 seconds back. The Vorne M1000 Display is a light industrial duty display with a rugged extruded aluminum enclosure. It uses super bright red LEDs which are easily readable in a variety of lighting conditions. This display is big enough to display everything the rider needs when they come through the scoring gate on one screen. Bike# 121 in 1st place. Bike #3 in 6th place, 1 minute and 5 seconds back (from 5th place). The BetaBrite Prism is a light duty one line display with a plastic enclosure. It uses multi-color LEDs that are readable if the display is shaded from the sun. As a comparison, the Prism is a little bit brighter than the Classic (below). Since it has only one line, the data presented to the rider are split up into two screens. The first shows Bike Number and Class Place. After a second or two, the screen rolls over and displays Time Back from the next place. The display will alternate between these two screens several times before returning to showing elapsed race time. Bike# 128 in 2nd place. The BetaBrite Classic is a light duty one line display with a metal and plastic enclosure. It uses multi-color LEDs that are readable if the display is shaded from the sun. As a comparison, the Classic is not quite as bright as the Prism. Since it has only one line, the data presented to the rider are split up into two screens. The first shows Bike Number and Class Place. After a second or two, the screen rolls over and displays Time Back from the next place. The display will alternate between these two screens several times before returning to showing elapsed race time. Note: These displays work with MotoTally for both manual data entry and electronic data collection methods!